On a hot, dusty afternoon in South Africa last spring, a man approached our mobile veterinary clinic with five dogs radiating on bits of rope and chain from his hand like so many spokes on a wheel. The man settled in the shade of a little tree and patiently waited his turn. Four of the dogs settled down with him. They were plump and shiny and panted gently as they watched the chaotic queue of people and dogs and cats and puppies and children bouncing everywhere. The fifth dog couldn’t settle. He strained at his chain, lunged and twisted and barked at everyone and everything. He was a tall, athletic dog, but very thin and mangy and his fur dry and patchy. He was clearly stressed out of his mind. When the man’s turn came, he explained that he had recently acquired this frenetic dog from someone who wanted to abandon him. He was worried that the dog was not eating well and had bitten people and other dogs. The other four dogs had come along just to keep the family whole on this excursion, and for us to see how well they looked: the man was proud of how well he took care of his dogs. He worked as a night security guard at a school, and his dogs went with him to his job. While he spoke, he stroked them in turn, and they blinked and panted and returned his affection with their soft, brown gaze. But the new dog whom he had saved from abandonment couldn’t be stroked: he was too restless and jumpy. 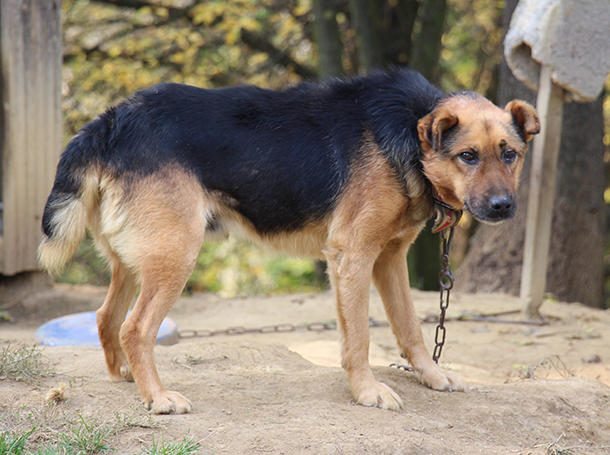 The man explained that the dog had been chained at his previous home, and he kept him chained now because he was so “crazy”. He was only a young dog, just a year or two. The man asked if he was possessed? Perhaps an angry neighbor had put a curse on the dog for barking too much? We frequently need to dispel superstitions about animals in our work around the world, but in a way, yes, it was a curse. It was the curse of perpetual chaining. This young, gorgeous animal was being driven out of body and mind by restriction of one of the most fundamental things that any creature - dog, human, hedgehog, parakeet, wombat, kudu, whale, butterfly and everything in between needs to keep body and soul together: the freedom to move, to meet friends, to avoid non-friends, to choose where to rest, to greet loved ones, to go to the toilet away from where one eats and sleeps. Living permanently on the end of a chain or in a cage takes away all of an animal’s choices for the most basic decisions, natural behaviors and social needs that we take for granted. Boredom, isolation, lack of exercise, the elimination of all choices, restriction from the opportunity to interact with the world. This is what we do to dogs when we chain or cage them. Moreover, a dog is built to move – particularly a young dog, and one built like our thin, frantic friend. They must run and play and work their muscles hard. If they can’t, their minds can’t work properly, just like a child who doesn’t get enough exercise can’t concentrate in school. Add to this the incessant frustration of not being able to do any of the other things that a dog needs to do, and we end up with a mad dog who can express his frustration only by biting and barking and straining at the tether. He isn’t a “bad” dog. This problem isn’t restricted to dogs who are chained in a dusty shanty town in Africa. I see it all over the world – from American suburbia to urban China – where dogs are confined to long, lonely, boring days in the house or chained to a stake in the yard while the owners are away at work. They wait all day for the moment that we return home and take them to the park to run and run and run and play, and to do that with us. We are their Person, their Pet Human, the Most Important Thing in their World. We owe them this daily time for exercise and play for what they bring to our own lives, and as responsible and humane guardians of animals. Taking the dog for exercise and play is as important as feeding her. So, we did what we do – we looked beyond the immediate problems of bad skin and poor appetite, and looked at the whole dog. We helped the lovely man with his five dogs fix the fence around his house, and then he removed the thin dog’s chain. We dewormed and vaccinated the dog as standard measures of preventive health care, but he didn’t need any drugs for his skin. His skin would heal as his mind healed. We also neutered him, which of course is essential for the dog to want to stay home rather than to go out chasing estrous-fragrant lady-dogs all over the county and getting hit by cars and fighting with other boy dogs over said fragrant lady-dogs. In many areas of the world, a dog’s main job is to guard the home. A neutered dog who is properly exercised and who is made to feel part of the family will stay home and look after that family with a loyalty and commitment that no high-tech alarm system can duplicate. He or she can’t do that if s/he is chained and isolated and frustrated. Every day, the man took his dogs into an empty lot in the township where they could run and play until they sank into happy exhaustion. At home, the dog now mixed with the other four and soon behaved as part of the family. A month later, when I saw him for his booster vaccinations, the dog was filling out and his fur growing in thick and shiny. His tongue lolled in a happy grin. He was still very energetic, but this time when he lunged, it was to plant a big slurp on my face. His Person stroked him and smiled. 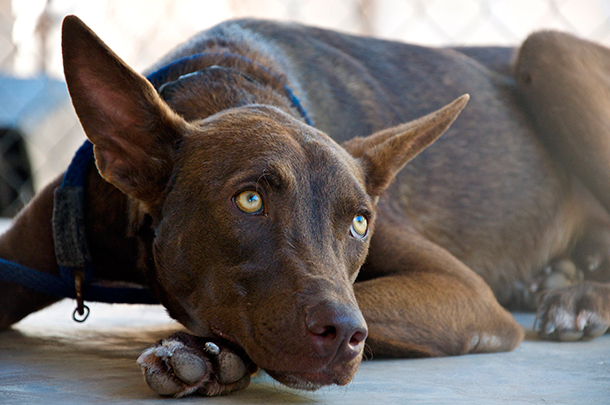 Learn more about IFAW efforts for cats & dogs on our campaign page.